Beautiful, pristine Palau! From above – and below – this small island nation is an eye-popping wonderland. These emerald dots in the Pacific Ocean belong to a 100-mile long archipelago found southeast of the Philippines. For me, the Republic of Palau was a stepping stone to the smaller Micronesian island of Yap – and an unforgettable encounter with manta rays. However, having travelled so far it would be rude not to explore a little! 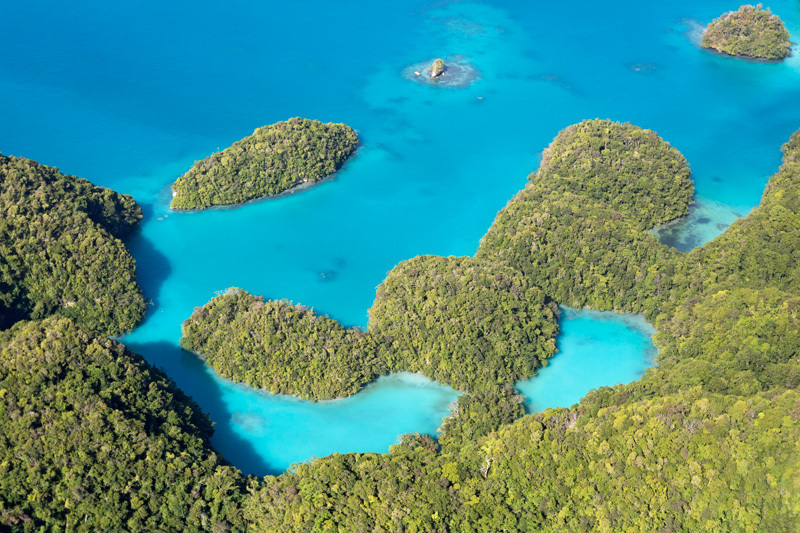 From the air, Palau’s Rock Islands resemble a scattered jigsaw of incredible blues and greens. 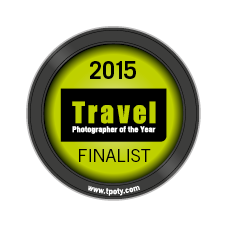 My photos were taken on an aerial tour with Smile Air, shooting from a small Cessna plane with the door removed! Taking off from Koror airport, our flight headed out over the beautiful blue. We passed Milky Way Lagoon where tourists seeking a natural spa treatment can plaster themselves in white limestone mud. 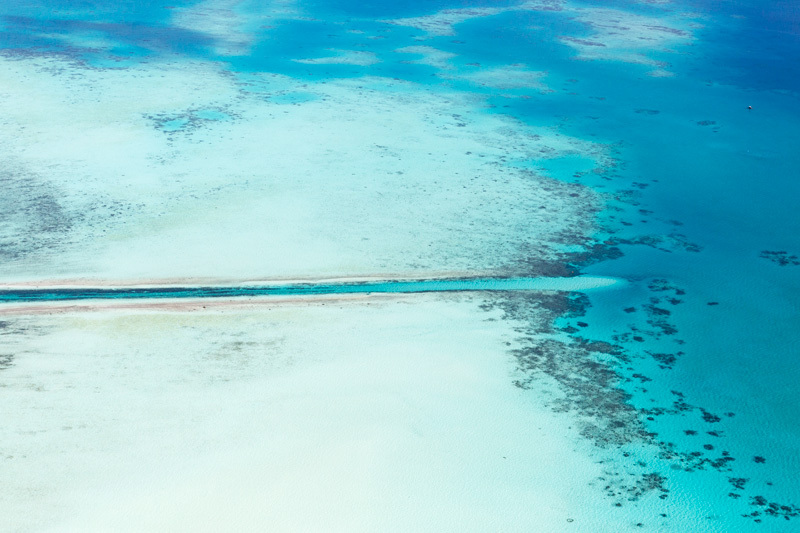 We flew above the German Channel, a man-made cut that connects inner reef with open ocean – and a famous spot for mantas. 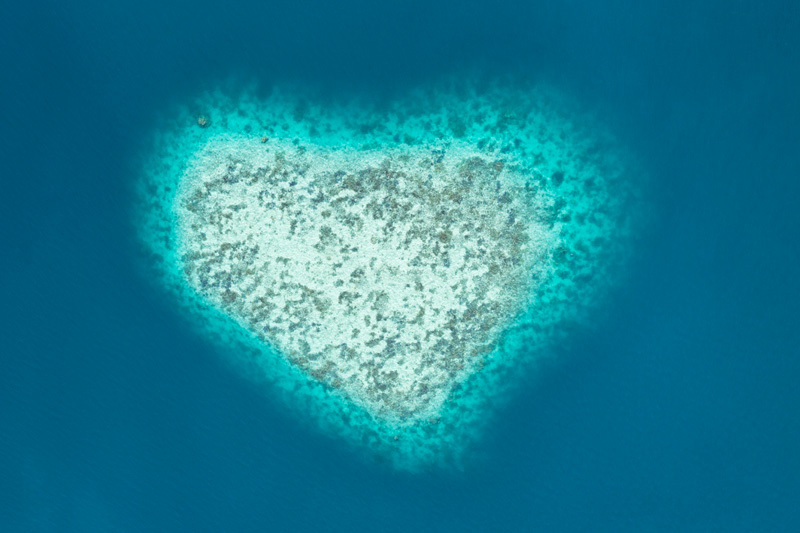 Then came the Rock Islands and coral atolls, priceless jewels in the sea. These waters are studded with hundreds of limestone islets and we circled a particular cluster – the Ngerukuid Islands (Seventy Islands). This wildlife preserve of mushroom shaped, jungle-clad rocks with turquoise lagoons and coral reefs is a UNESCO World Heritage Site. And it is simply stunning. 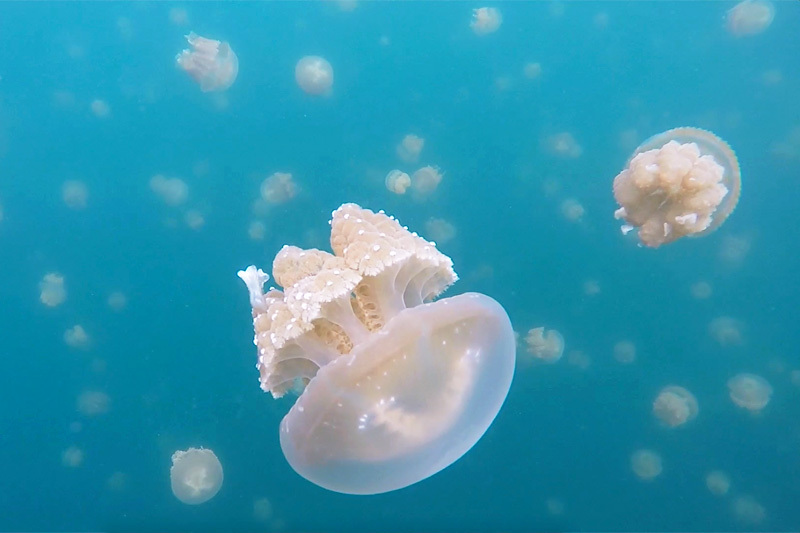 This video from Palau Dive Adventures puts my own attempts to shame and reveals some of Palau’s amazing marine life. The country’s waters are home to over 1,450 species of fish and 700 species of coral. Go on, dive in, take a look! Research by the Manta Trust is helping to raise awareness of local manta ray populations and the pressures they face. I didn’t see any mantas in Palau but did venture to Blue Corner, one of the world’s most action-packed dive sites where large pelagic species are the main attraction. Sharks? Yes, lots of sharks! Aggregations of grey reef sharks patrol the dramatic depths along a sheer sea wall – among a multicoloured kaleidoscope of butterfly and triggerfish. 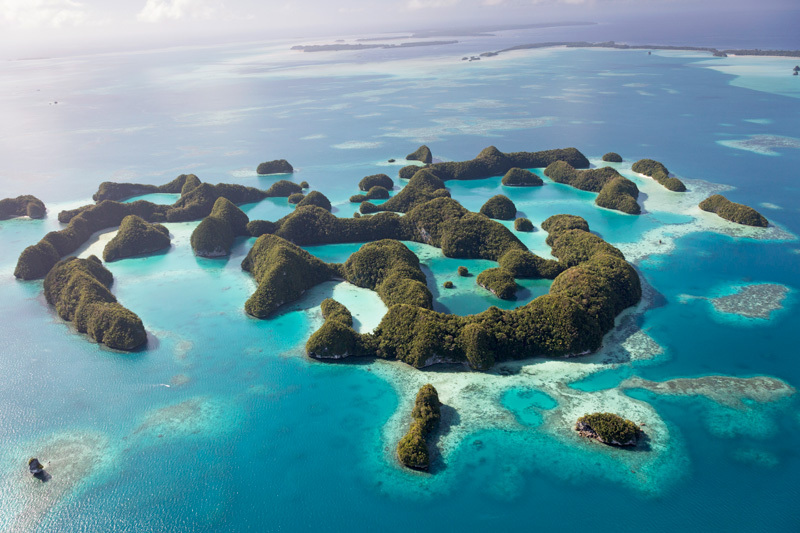 In 2009, Palau became the world’s first national shark sanctuary, ending all commercial shark fishing in 237,000 square miles of ocean – an area the size of France. Studies in Palau estimate that a single reef shark can contribute almost $2 million in ecotourism benefits over its lifetime. In contrast, the fin of a dead shark can only be sold once, for a mere $100. Unfortunately, regardless of all the good that they can contribute to healthy ecosystems and human communities, sharks continue to be fished at a pace that far exceeds their ability to reproduce. Speedboats skim across clear water, through a labyrinth of weathered limestone. The most popular tour of all leads to Eil Malk island. Venture ashore, into the welcome shade of dense forest, and you will arrive at the lip of a tranquil lake. More commonly known as Jellyfish Lake. 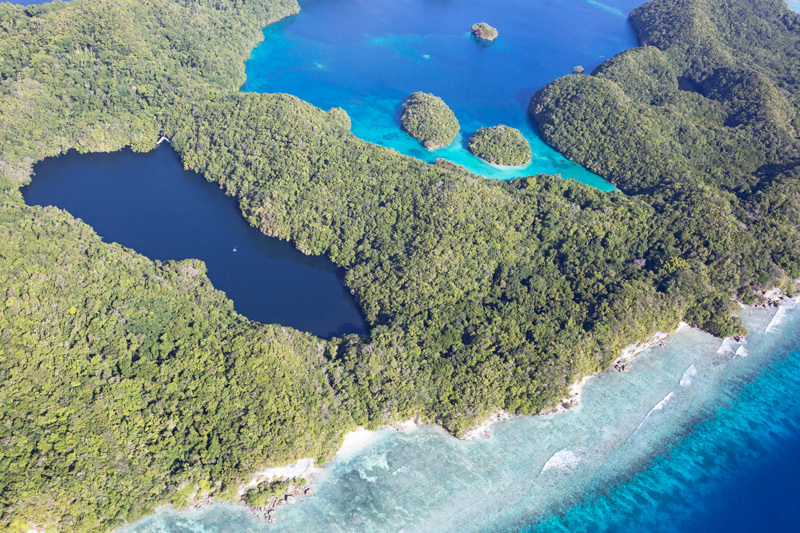 Jellyfish Lake (Ongeim’l Tketau) is one of Palau’s natural wonders. Over thousands of years, millions of jellyfish have lost their sting. Now they harmlessly pulsate back and forth, chasing the sun in a daily migration. A unique subspecies only found in this one lake, golden jellyfish (Mastigias papau etpisoni) run on solar polar. Their tissues contain photosynthetic algae called zooxanthellae, which harvest sunlight and produce glucose that jellies use for energy. Strange isn’t the word. Surreal more apt. Snorkel in mouth, I was floating in a saltwater lake surrounded by a mass of jet-propelled, primeval bodies. Golden jellyfish seek the sun and are careful to avoid shadow areas around the lake’s edge – where predatory anemones lie. This isolated home brings other dangers. In 1999, the jellyfish population crashed, possibly due to overheating in warmer water linked to El Niño. Pressure from tourism is also taking its toll. 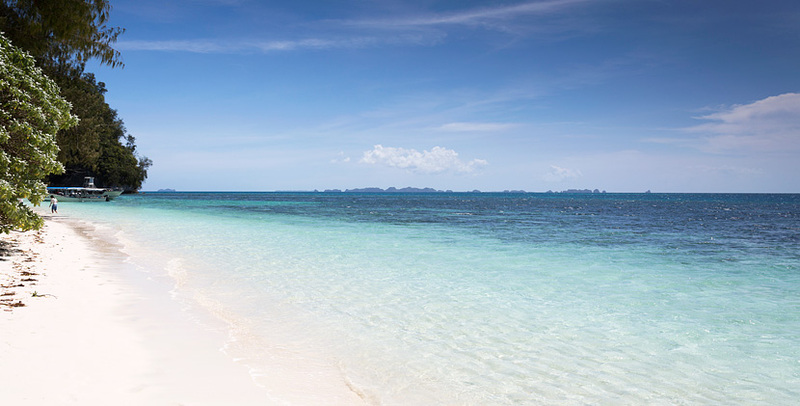 Visitors are encouraged not to apply sunscreen, to use only clean snorkelling gear, and to swim with slow, gentle movements. I still witnessed people wanting to handle these fragile creatures. Please don’t! Famed for its world class diving, the Republic of Palau also has a rich cultural heritage. Take a short drive from the capital of Koror and you can be roaming the empty roads of Babeldaob. This is a large, secretive island with jungle hikes to wonderful waterfalls. Visit a traditional Paluan bai (men’s meeting house) or follow the road north to Ngarchelong State – to the archaeological site of Badrulchau. 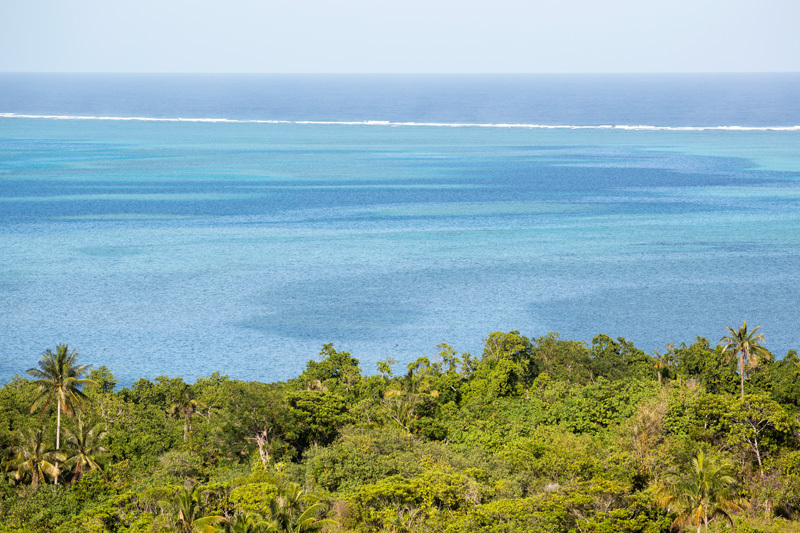 From the shade of a small thatched hut, I looked out over native forest and a sea of pastel blues. The road had ended and I was sat atop a small hill above a group of ancient standing stones. 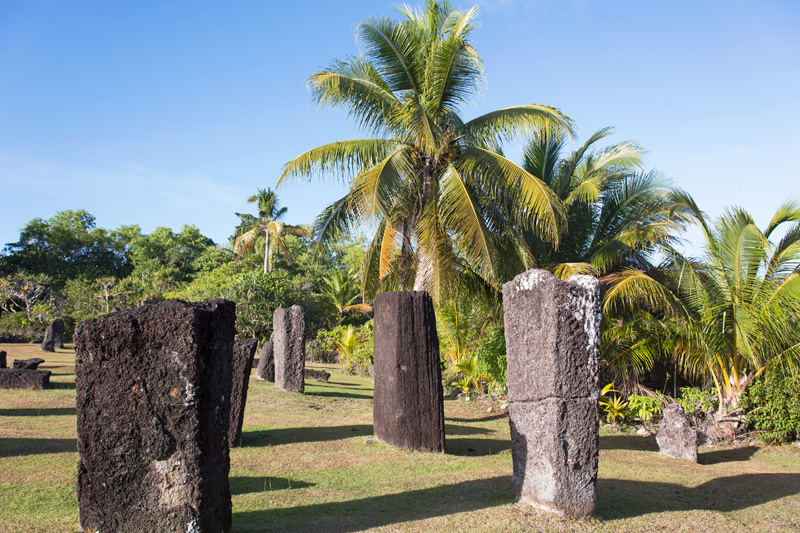 Badrulchau dates back as far as A.D. 161 but the origin and purpose of these large basalt monoliths is unknown. One legend says that the mysterious pillars were placed here by the gods, as a foundation for a gigantic bai meeting house. The view is certainly heavenly and all too soon it was time leave. The sun was sinking, fruit bats took to the sky, and I had a flight to catch. With a lingering last look – and wearing the biggest of smiles – I said farewell to this wonderful place. Palau – ‘where the rainbow ends’. P.S. The beaches aren’t bad either!